This article is a chronicle of the history of the Western Rite in the Twentieth Century. The so-called "Fond du Lac Circus" of November 1900 (the consecration of Reginald Weller, co-adjutor bishop of the Episcopal Diocese of Fond du Lac). Saint Tikhon is pictured on the far right, with Father Sebastian Dabovich (with the beard and hat), and the clean shaven priest behind him is Saint John Kochurov of Chicago, Protomartyr of the Bolshevik Revolution. The famous Anglo-Catholic Bishop of Fond du Lac and close friend of Tikhon, Charles Grafton, is seated on the front row, in the middle. In 1926, the so-called "Polish Catholic National Church" (headed by Fr. Andrew Huszno) (really no more than six parishes) was received into the Polish Orthodox Church. This group flourished until the Second World War, during which it was wiped out due to Nazi aggression. In 1890, the very first North American Western Rite Orthodox community, the Swiss Old Catholic parish of Green Bay, Wisconsin, pastored by Father Joseph Rene Vilatte, was received by Bishop Vladimir (Sokolovsky). However, Fr. Vilatte, who proved an ecclesiastical wanderer, soon led the parish into Old Catholicism. Saint Tikhon (Bellavin), in his time as head of the Russian mission in America, came into contact with many sympathetic Episcopalians, many of whom apparently inquired about the possibility of joining the Orthodox Church while keeping much of their Anglican liturgical usages. Tikhon enquired of the Holy Synod of Russia about the possibility of such a scheme. He sent a copy of the 1892 American Book of Common Prayer for examination. In 1904, the Holy Synod returned a fascinating response to Bishop Tikhon's enquiry, "Observations on the American Book of Common Prayer," admitting the possibility of such a scheme, while very clearly noting how the Prayer Book could be revised in an Orthodox manner. 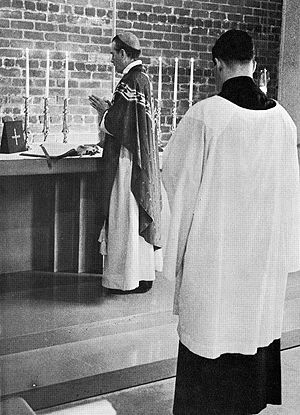 While Tikhon did not actually receive any Episcopalians who used revised Anglican forms, this synodal response would serve as a guide for the establishment of the WRV's basic liturgical life in 1958, and the approval of the Anglo-Catholic "Liturgy of Saint Tikhon" in 1977. Aside from these, two significant 20th century Western Rite Orthodox movements occurred, building on the principles established by the work of Dr. Overbeck, one in France and the other in the United States. In 1937, the Church of Russia received a small group under Louis-Charles (Irénée) Winnaert (1880-1937), under the name l'Eglise Orthodoxe Occidentale ("Western Orthodox Church"). Winnaert's work was continued, with occaisional conflict, by Evgraph Kovalevsky (1905-1970) and Lucien Chambault, the latter of which oversaw a small Orthodox Benedictine community in the rue d'Alleray in Paris. After 1946, Kovalevsky developed the Eglise Orthodoxe de France to restore the Gallican usage based on the letters of St. Germanus, a 6th century bishop of Paris, as well as numerous early Western missals, and sacramentaries. This resulted in the Divine Liturgy according to St Germanus of Paris. Archimandrite Alexis van der Mensbrugghe was also associated with them, desiring the restoration of the ancient Roman rite, replacing medieval accretions with Gallican and Byzantine interpolations. Eventually Fr. Alexis was consecrated a bishop of the Church of Russia episcopacy in 1960, continuing his Western Rite work under the auspices of the Moscow Patriarchate. After some years of isolation, Kovalevsky's group came under the Russian Orthodox Church Outside Russia between 1959 and 1966, with Kovalevsky consecrated in 1964 as Bishop Jean-Nectaire de Saint-Denis receiving considerable encouragement from St. John Maximovitch (ROCOR's representative in Western Europe at the time). St. John's repose in 1966 was a serious blow to these French Orthodox Christians, who had a holy patron in St. John. While Moscow's Western Rite mission withered and ended, Bishop Jean's church continued to thrive; however, after St. John's repose, without canonical protection. Bishop Jean reposed in 1970, but in 1972 the Church found a new canonical superior in the Church of Romania. Gilles Bertrand-Hardy was then consecrated as Bishop Germain de Saint-Denis. In 1993, after lengthy conflict with the Romanian Holy Synod, the latter withdrew its protection of the French Church. The Romanian patriarchate established a deanery under Bishop Germain's brother Archpriest Gregoire Bertrand-Hardy to minister to those parishes which chose to stay with the Romanian Patriarchate. Ten parishes that neither remained with Germain nor Romania formed the Union des Associations Cultuelles Orthodoxes de Rite Occidental (UACORO - the Union of Western Rite Orthodox Worship Associations), and began negotiations in 2004 with the Church of Serbia to be taken under its omophorion, with the intention of the UACORO entering the Diocese of France and Western Europe.
. The most successful and stable group of Western Rite parishes originated within the Orthodox Church under Bishop Aftimios in the 1930s as part of the American Orthodox Catholic Church. In 1932, Bp Aftimios consecrated an Episcopalian priest as auxiliary Bishop of Washington and assigned him to the Western Rite parishes. However, in 1934, due to the Bolshevik Revolution which sundered any ethnic unity in America, Bp Aftimios' group was left in canonical limbo. In 1961, the Society was received into the Syrian Antiochian Archdiocese on the basis of Metropolitan Antony's 1958 edict. Upon reception, Bishop Alexander Turner became a canonical priest of the Orthodox Church, guiding the group as Vicar-General until his repose in 1971. After his repose, Fr Paul W.S. Schneirla became Vicar-General. Besides the original communities associated with the Society, a number of other parishes have been received into the Western Rite Vicariate of the Antiochian Archdiocese, particularly as the theological and practical devolution of the Episcopal Church U.S.A. picked up speed in the latter half of the twentieth century and the beginning of the twenty-first. Additionally, several Western Rite missions have been founded, some growing into full parish status. The Church of Russia also has a history of Western Rite Orthodox work in the United States. Bishop Dositheus (Ivanchenko) received a New York Old Catholic community in 1962 as Mount Royal Monastery in Woodstock, NY. The monastery later served a chapel in St. Nicholas Cathedral in New York City under the omophorion of Archbishop John (Wendland) of the Russian Exarchate of North America, only later to be received by the Russian Orthodox Church Abroad and Archbishop Nikon (Rklitzsky) in 1975. In 1993, Abbot Augustine (Whitfield) retired to Jacksonville, Florida. The prior of Mount Royal then founded Christ the Savior Monastery or Christminster and relocated to Providence, Rhode Island, under Archbishop Hilarion (Kapral) of Sydney, then of Manhattan. Its present abbot is Dom James Deschene. In Australia and New Zealand, Western Rite Orthodox works originated almost entirely from Anglican and Continuing Anglican communities. Archbishop Hilarion (Kapral) of Sydney of the Russian Orthodox Church Abroad received those communities under his omophorion, while the Antiochian communities in Australia and New Zealand were received both by Bishop Gibran, and later Metropolitan Archbishop Paul. Other small groups following the Western Rite have been received into the Orthodox Church, but usually have had little impact or sometimes declared their independence subsequent to their canonical reception. Further, the Oriental Orthodox have also done some Western Rite work. In 1889, the Syrian patriarchate of Antioch consecrated Antonio Francisco Xavier Alvarez as Archbishop of Ceylon, Goa and India, authorizing a Roman rite diocese under him. Additionally, in 1891, the Syrians consecrated Joseph René Vilatte as archbishop for the American Old Catholics. Order of Saint Benedict (Orthodox). Wikipedia. Fr. Anthony Bondi (Pastoral Vicar). The Untold Secret: Many former Anglicans join the Orthodox Church. Virtue Online: The Voice for Global Orthodox Anglicanism. December 14, 2012. This page was last edited on January 27, 2013, at 22:33.